Olympians. They're just like us! They train nonstop for four years in order to win gold medals... and they eat at McDonald's. OK, maybe just that last part. One of the more surprising things about Olympians are their unconventional diets -- whether it's eating Big Macs at 9am or PB&J burritos. 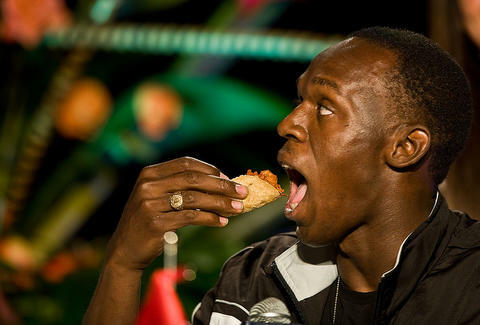 Here are some of the most unexpected eating habits of world-class athletes. During the Beijing Olympics, the fastest man in the world ate a steady diet of McDonald's finest chicken-based food because the Chinese cuisine wasn't agreeing with him. Because he's an athlete who needs more calories than most humans that meant eating 1,000 McNuggets per day for 10 days. Just because badminton doesn't seem like a particularly grueling sport doesn't mean the athletes don't eat like weightlifters. Case in point: Australia's Sawan Serasinghe consoled himself after a loss in Rio by feasting on enough Mickey D's to feed a family of four. The US men's basketball squad destroyed the Chinese team 119-62 in a lopsided affair. But the Chinese b-ball players are winners in another sense: they eat McD's most famous burger for breakfast. Does that mean they lunch on McMuffins? Laurie Hernandez won gold for Team USA in the women's team all-around competition, and like everyone from New Jersey, she loves the gas station chain Wawa. That might seem strange if you've never eaten in one, but the food there is fantastic (try the Gobbler!). Her brother says when she gets back from Rio, they're going there to celebrate. Phelps famously ate more food than most people eat in a week (with the exception of Matt Stonie) to train for the 2008 Games. His eye-popping 12,000-calorie diet included whole pizzas, five-egg omelets, and literal pounds of pasta. But in 2016, things changed. When asked what he eats these days, he told the Washington Post, "not much." As for his favorite foods, they include non-crazy choices of grilled chicken and Mexican food. Gold medal-winning gymnast Biles told ABC News she houses pepperoni pies after every meet, regardless of how she performs. Remember that whenever you lazily order a pepperoni pizza for delivery next time: you're basically like an Olympian. Time magazine reported on US rower Seth Weil's morning meal, which includes 20oz of coffee and PB&J in a flour tortilla. Because rowers famously get up early, he's consuming that at 6am. Somehow this seems stranger than the Chinese athletes who eat Big Macs for breakfast. The fact that Lochte eats pizza and drinks sugary soda for his cheat meal isn't particularly groundbreaking. What's crazy is that he's had them every single Friday since he was 8 years old, and has only missed them six times, he told Bon Appétit. He's a true American hero. Lee Breslouer is a senior writer for Thrillist and should start eating pizza once a week. Follow him to diet plans: @LeeBreslouer.